Treen is a term used to describe small items made of wood (made of "tree"; wooden). This mandrel system allows you to turn small lidded vases and other small projects with minimal effort and maximum precision. The system comes with two mandrels, one for turning the body of the vase and one for turning the lid of the vase. The body of the vase is drilled with a 1-1/4" hole. The lid is made on the lid mandrel in two pieces that are connected to form the top. One piece becomes the stopper (inside the vase) and the other is the finial top. The pieces are held together with an aluminum fitting with internal threads. Cork may be used on the stopper section of the lid to create a tight fit. The Body and Lid mandrels are each held on the morse taper adaptor with set screws. An additional morse taper adaptor is available so each mandrel has a dedicated taper. 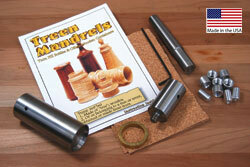 The Treen Starter Kit includes: the Body Mandrel and Lid Mandrel, Three Sets of Fittings for assembling the lid & stopper of the bottle, a 6" x 8" Cork Sheet for lining the stopper and Instructions. You will need one set of fittings for each lid & stopper that you turn.